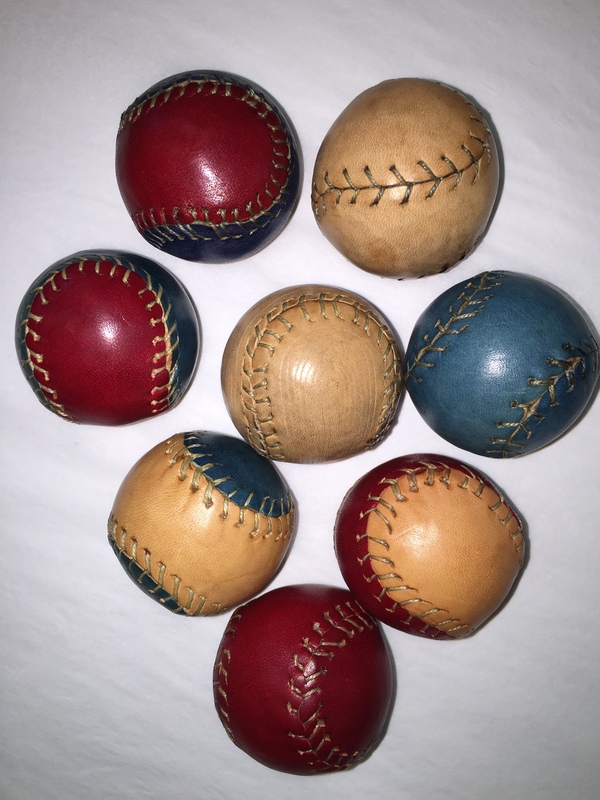 My New Leather Balls – Art's Musings, etc. 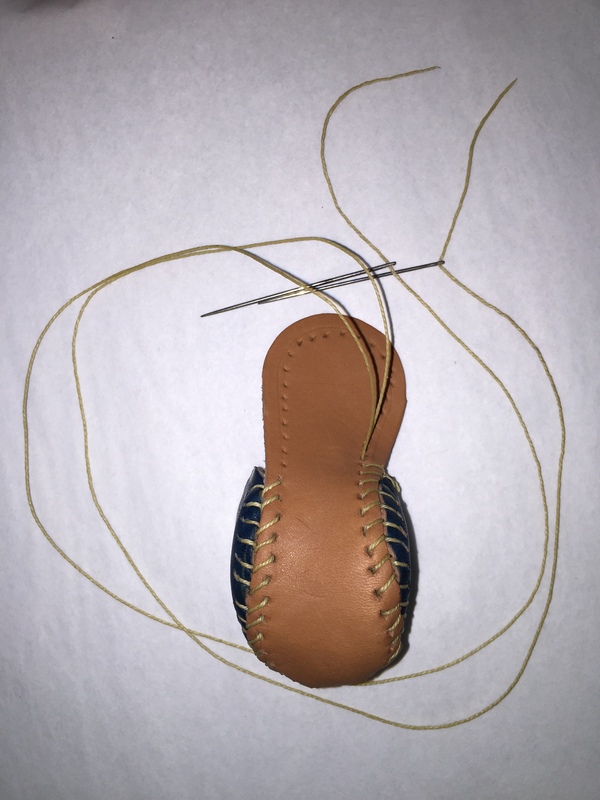 I realized that I might be able to attract a new audience through internet searches on this one, but if you aren’t interested in baseball, math, or leatherwork, you may be disappointed! I’ve always liked to make shapes with leather. 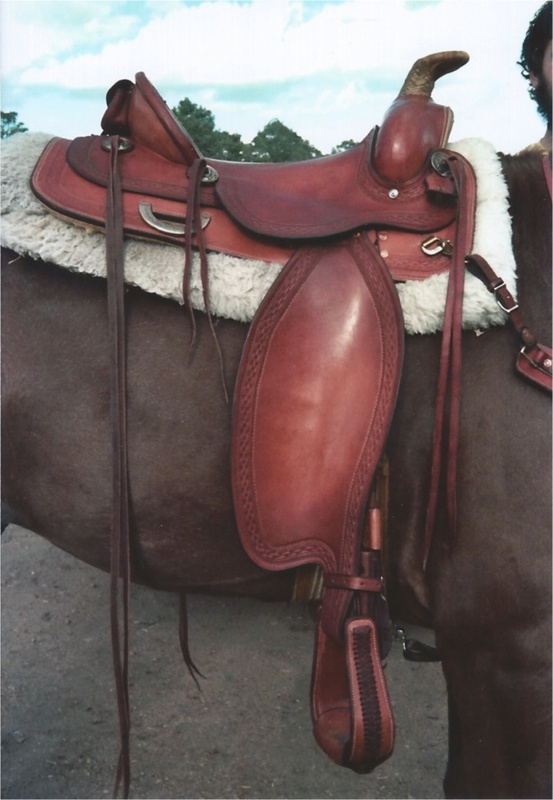 I think that the thing that attracted me most to saddle making was the extreme moldability of leather, which is most evident on the front “swells” or pommel of a saddle. The top of the swell is a single piece of leather that is formed very wet, tacked down into the saddle tree, and dried. After getting to know many artists and craftsmen over the years, I’ve come to the conclusion that people gravitate to the medium that fits their personality the best. I like wood working but am not very good at it. I think I’d do even worse with metal working or glass. I’ve tried sewing with fabric, but most fabric is too soft and flexible for my touch. Leather seems to be about right for me: it holds its shape but allows a lot of forming and manipulation if you know how to do it. The Artisans’ Guild Gallery, my artist co-op in Gainesville, always has a Christmas tree ornament sale each holiday season. I’ve never contributed to this but always wanted to try something. This year, I decided to try to make small leather balls covered with leather. When you think about balls covered with leather, the first thing (most?) people (probably?) think about is a baseball. Baseballs are really quite beautiful objects. 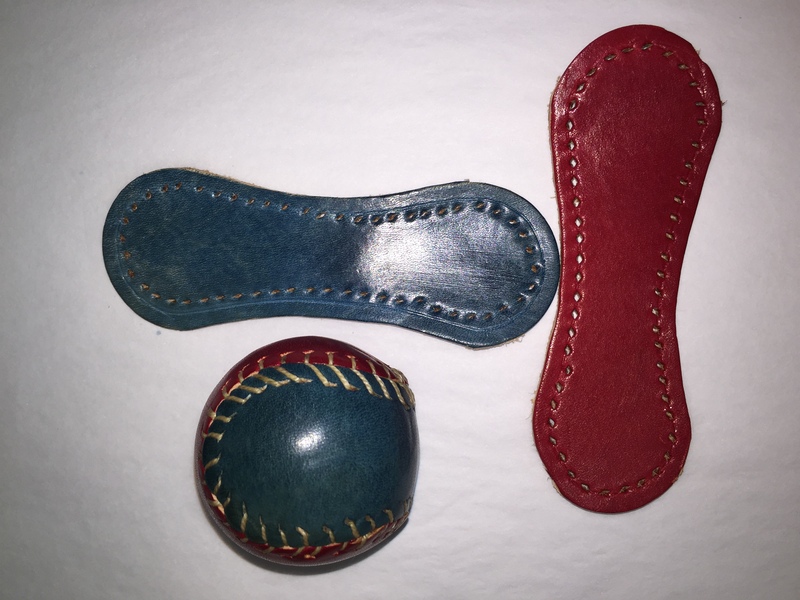 They have a solid core and are covered with 2 identical pieces of leather sewn together with a “baseball stitch”. I’ve done a few things like this over the years by trial and error, but I decided this time to see if there was a formula to relate the 2D leather shapes to the size of the ball I wanted to cover. You would think that it would be pretty straightforward to have a computer program that would calculate the 2D shape if you enter the diameter or circumference of a ball. It turns out that this is a very complicated problem! The final 3D ball and the starting 2D pieces. I found a very nice article called “Designing a Baseball Cover” by Richard B. Thompson at Arizona State University. 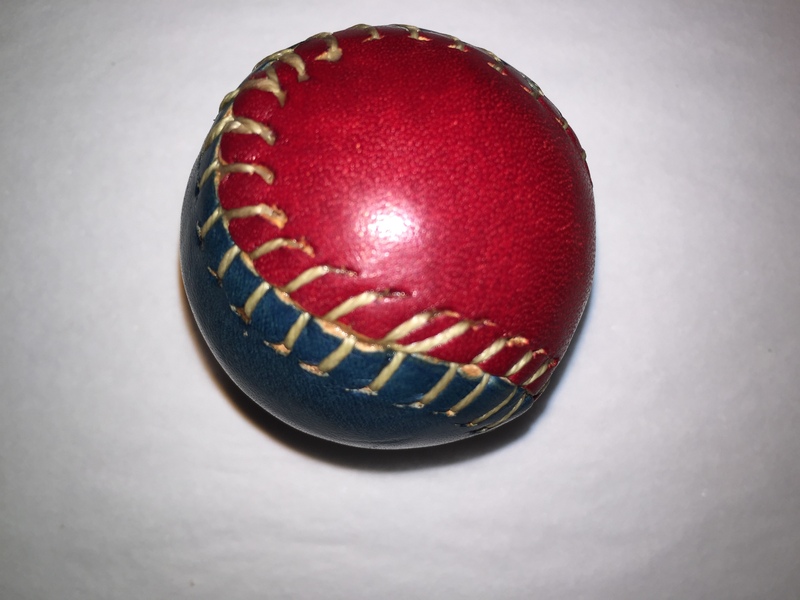 In this article, Dr. Thompson introduces us to the history of the baseball, which was made by trial and error in the 1860s by a guy named C. H. Jackson. I’ve done this several times with varying success, so I can vouch that it is not too hard to do. Dr. Thompson answers the question I posed above. With the input of the circumference of a ball and the spacing between the seams at the closest point, he shows that you can find the 2D shape to cover a baseball. He starts by describing the shape of the seam in 3D on a ball and works his way to mapping this to a 2D pattern. I’m not great at math, but I do like it. I use the computer program Mathematica in my day job, and I spent several hours yesterday trying to put Dr. Thompson’s derivation into a Mathematica Notebook so that I can enter a circumference and get a pattern ready to print out. I had a great time doing this and really grew to appreciate how fun this problem is, but I was only able to make it to describing the seam on the surface of a ball. I kept on getting a mistake (a discontinuity where 2 different functions are used to describe the curve and almost linear region), and I never was able to solve the improper integral to get a working pattern. I’ll be happy to send one of my balls to the first person who sends me a working Mathematica Notebook with this done right! My time in the shop is way too short these days, so after several hours of trying to solve the baseball cover program on my computer, I went into the shop and managed to find a decent working pattern for a golf ball in about 30 min. It isn’t perfect, but leather is pretty moldable, so I’ve been able to make a bunch of leather covered balls. I’m not sure what they are for, but I think they would be fun Christmas decorations (slightly heavy…), good worry balls to rub, or (as a friend told me to today) juggling balls. Or they might just remind you about how interesting the problem of covering a baseball really is! Thanks for this. Any chance you could provide some information about the stitch you used to join the two sections? Hi Phil, My apologies for the very late reply! Somehow I missed this earlier. The stitch is called a baseball stitch (at least I only know it by that name). It is a great way to join two pieces by their edge, especially when they cover a hard thing like a baseball. It is hard to describe it in words, but you start with one length of thread centered at the starting point. I use two blunt needles on each end, but you could do it all with an awl and no needles. I pre-cut my holes with regular spacing. Then to be honest, I start and stop several times before I get the pattern right. It is simple, but there are several ways to not do it right and only one way that it works correctly. The thread passes only one hole ahead each time, and if you pay attention to where it crosses over vs. under, you can get it. (google can help too! ).